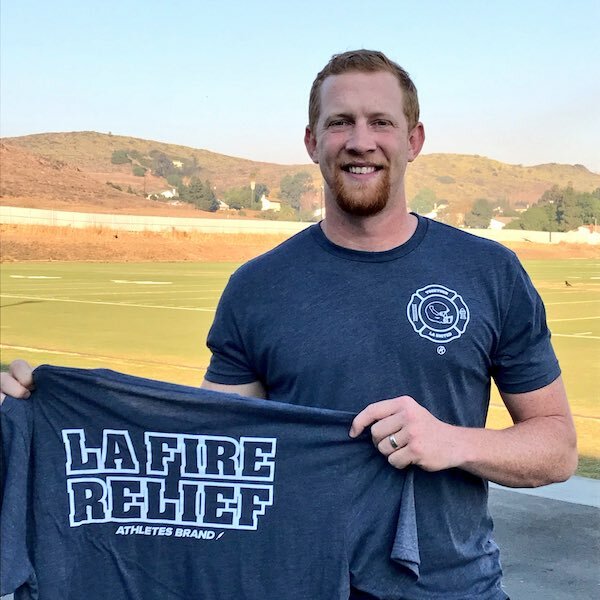 WASHINGTON, D.C. – Johnny Hekker has been named Week 14 NFLPA Community MVP for organizing multiple grassroots efforts to help victims of the ongoing Los Angeles wildfires. When the Los Angeles Rams punter drove home one day earlier this month, he could see the flames and smoke from the Thomas fire roaring through the woods and homes of Ventura County. The scene moved Hekker to take immediate action, as he and his wife Makayla, who is seven months pregnant, jumped in their truck and drove to a local Target. There, they grabbed all the diapers, sweatpants, sweatshirts and sports equipment that would fit into their vehicle and then headed to a shelter for wildfire victims at the Ventura County Fairgrounds. The Hekkers spent 45 minutes unloading the supplies before shaking hands and offering encouragement to those who had been displaced from their homes as well as the volunteers. But Hekker didn’t stop there. In the following days, he tweeted out information to his nearly 41,000 followers about collection sites where local residents could drop off shoes, socks and other supplies to those in need. He also approached the Rams staff about how the team could get involved. A partnership with American Red Cross was soon formed and several Rams players followed Hekker’s lead by donating food and daily essentials. With the Thomas fire now ranking among the largest in California history, Hekker decided to launch a T-shirt campaign on Thursday with the United Way of Los Angeles. One hundred percent of the proceeds from the specially designed T-shirts, which read “Together LA United” on the front and “LA Fire Relief” on the back, will benefit United Way’s Southern California Wildfire Relief Fund. In honor of Hekker being named this week’s Community MVP, the NFLPA will make a $10,000 contribution to his foundation or charity of choice along with an in-kind donation to him on behalf of our supporting partner Delta Private Jets. Hekker, along with the other 2017 Community MVPs, will also become eligible for this year’s Byron Whizzer White Award, which is the highest honor that the NFLPA can bestow upon a player.